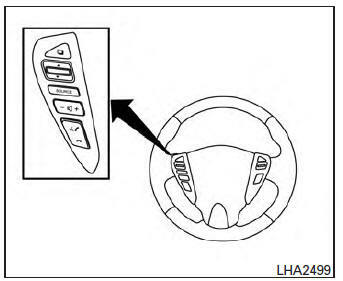 The control buttons for the Bluetooth® Hands-Free Phone System are located on the steering wheel. initiate a VR session or answer an incoming call. interrupt the system feedback and give a command at once. See “List of voice commands” and “During a call” in this section for more information. button for 5 seconds to quit the Voice Recognition system at any time.